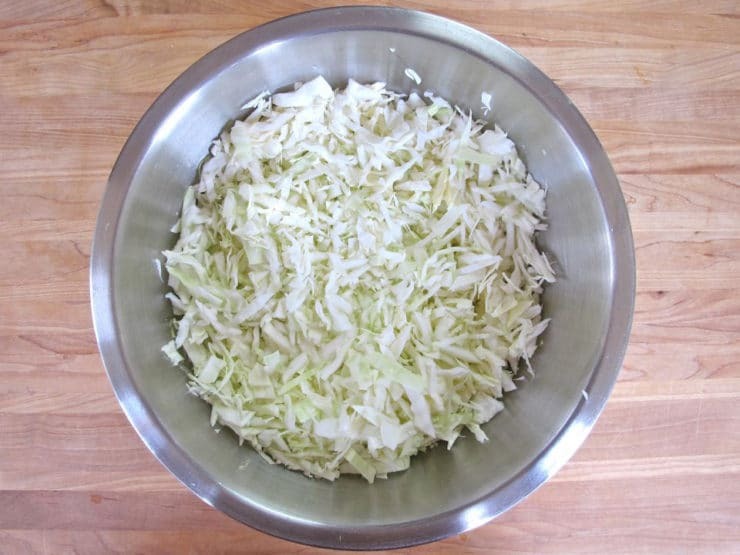 Shredding cabbage is a useful skill when making salads like coleslaw, or soups where you need finely textured cabbage pieces. I’ve never liked the texture that comes from shredding cabbage with a grater or food processor– the results are always too fine, without enough crunch. 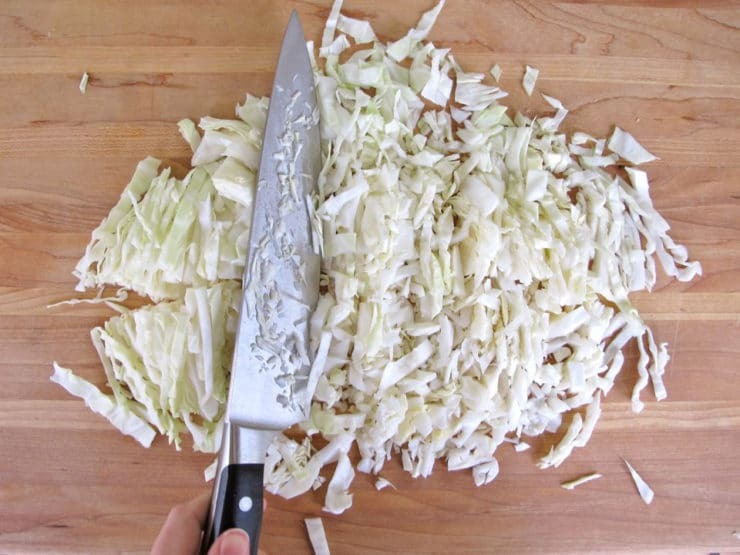 Luckily, it’s very easy to shred cabbage with a knife to create the perfect texture. 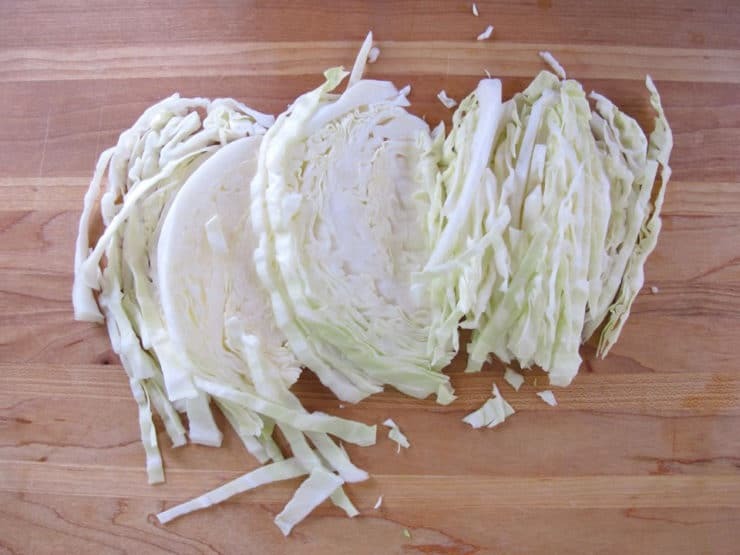 While it might seem like a no-brainer, properly shredding cabbage is a bit of an art form. The method is super easy once you get the hang of it. Here’s how! 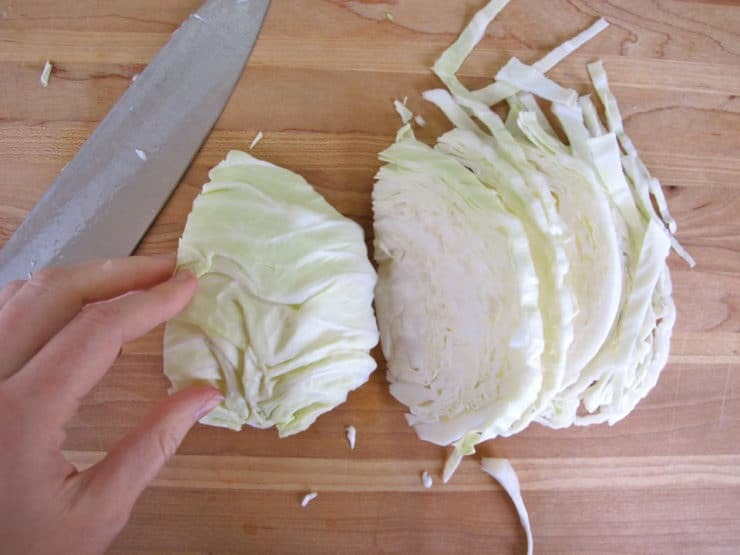 Rinse the cabbage and remove the loose outermost leaves so only clean, compact leaves remain. Cut the very bottom of the stem off to flatten the bottom of the cabbage. Turn the cabbage so the stem end is flat against the cutting board. Remove the stem and tough core from each wedge by cutting diagonally across to remove the solid parts. 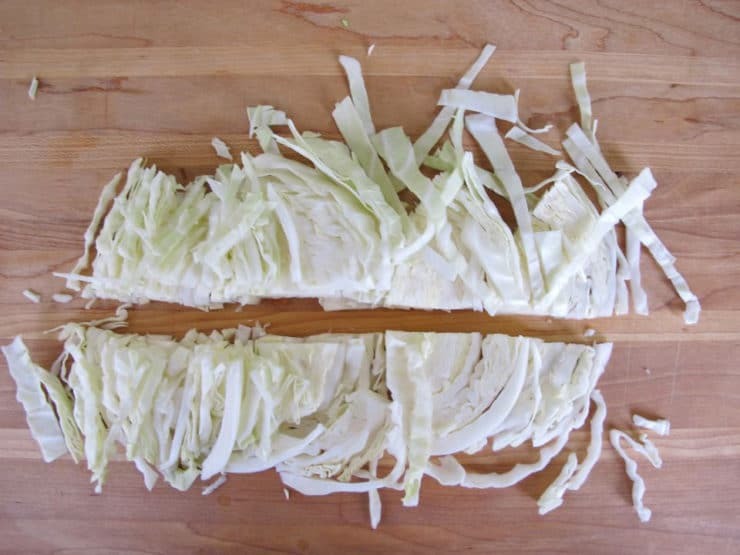 For each wedge, start by turning the cabbage so the flat part of the wedge is against the board. 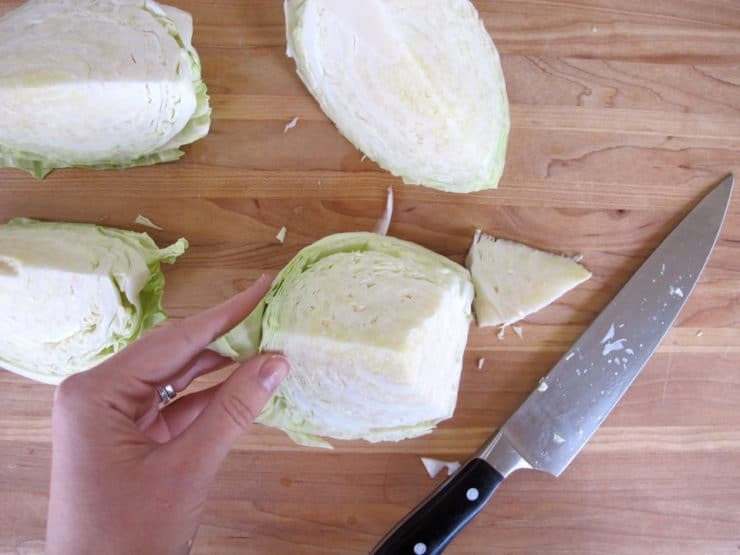 Thinly slice the cabbage into strips, going as far as you can across the wedge before the remaining wedge becomes too small to manage. Turn the unshredded part of the wedge so it's flat against the board and sturdy. Continue slicing till the entire wedge is shredded. Slice the shreds in half horizontally to shorten them. Place your shreds in a bowl. Repeat the shredding process for the remaining wedges. Proceed with your recipe. 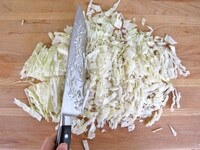 I was just about to start looking for a Julienne slicer after I saw a great recipe for shredded cabbage salad. (Even though my gut was telling me it was a bad idea, I just didn’t know why) Now I’ve learned why I can do it myself even better, thanks! So, I’m probably stupid, but in the step “For each wedge, start by turning the cabbage so the flat part of the wedge is against the board. 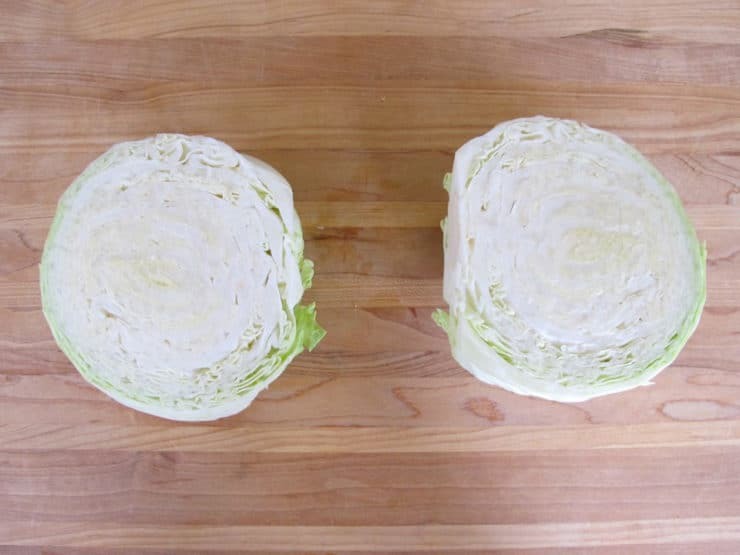 Thinly slice the cabbage into strips, going as far as you can across the wedge before the remaining wedge becomes too small to manage.” – which flat part? There are three sides on the wedges. I’m guessing one of the bigger flat part (not the diagonal cut)? And where do you start cut the wedge, or rather, what direction do you face the diagonal cut? To the right, left, up or down (if viewed from above). I have tried shredding cabbage with different methods, but have almost never succeeded, that’s why I’m asking, so I’m getting it right from the start :). Either one of the longer flat sides is fine. Don’t lay it on the triangular side, that would be awkward to slice. I’ve always used the pre-shredded bags of coleslaw cabbage, but I got a head of cabbage from a CSA and needed to care of business myself. THANK you!! You saved me. The pictures helped a ton. Thank you, thank you and thank you again. Live in area of total eclipse and I’ve been assigned Cole Slaw. For the first time in my old life, i now know how to do it RIGHT. 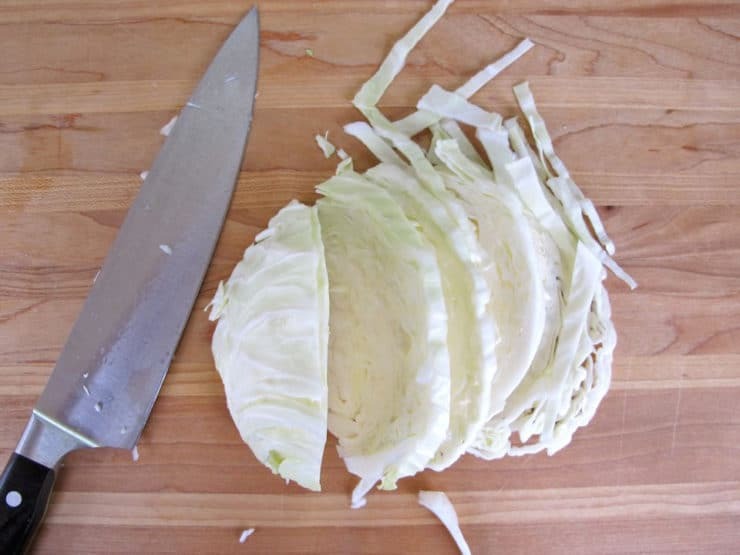 After reading all the comments about the problems of shredding the cabbage for coleslaw , I have tried many knives, food processor and could never shred the cabbage thin enough for my family.. one day I tried the large serrated bread knife and lo and behold it shreds perfect. Pre soaking the cabbage for coleslaw is a must. Fantastic pictorial..loved the step by step method .. Thank u so much fir sharing.. This is pretty much how I go about shredding cabbage. Unfortunately I get lazy and lose discipline, so my slices start out nice and thin but then get too wide as I finish. I think even the slicing in the pictures is a bit wider than I want, but at least its professional and uniform. That is why I was searching for another method. I have made coleslaw all over the world. I am a Brit but live in Chile. My food processor broke down so I googled for a way to shred cabbage and thanks to your method we are back on line. Coñeslaw for all my friends. Someone said they had problems with dull knifes. A simple knife sharpener is the answer. One with two slots, one for sharpening and one for honing the blade is best. Costs less than $20.00 on Amazon and lasts forever. One more gadget I know but really worth it for chefs. Shredding is not my problem and my dressing is a favorite. The problem is with the cabbage. No matter how thick the dressing is or how soon I dress the cabbage it always becomes “watered down.” Is there a way to treat the cabbage before dressing it? I don’t know of any way to pretreat the cabbage– perhaps try using less dressing? Or shred the cabbage into slightly thicker pieces? We have a family recipe – lightly salt the cabbage after you have shredded it. Let it sit on paper towels and the salt will drain the water from the cabbage. 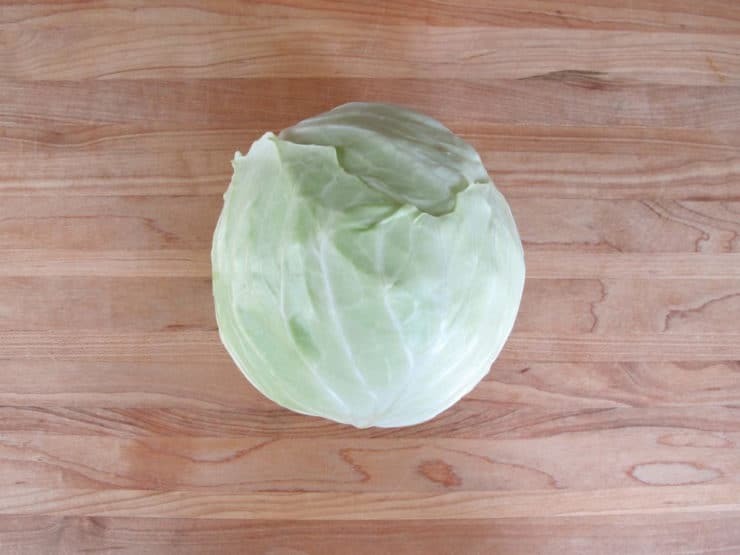 Then take handfuls of cabbage and squeeze out any excess water over the sink. It takes time but it makes the cabbage delicious. I’m now learning to cook because I’ve developed severe food allergies and I can’t trust restaurants anymore. I googled and found your sauerkraut recipe, which I decided to make. But then, I realized you started that out with shredded cabbage, and I drew a blank. So I googled “shred cabbage” and thankfully no one laughed at me, but your site came up again, with these instructions. Earlier today I burned a pan, trying to clean it with vinegar. I left the burner on too long and the vinegar evaporated. When I finally graduate to boiling water correctly I will first look it up on your site. Thank you. Congratulations on learning to cook! I always clean my pans with a bit of baking soda and water first, then dish detergent. Works like a charm! Thank you! Lots doable now! I have been wanting to make sauerkraut so i typed in “fermenting cabbage”.. Up you come and i’m so happy i found your site. I also planned on getting a food processor. The knife seems so much better. Thank you. I will use a large ceramic sugar container for my crock. So thankful I found your site. 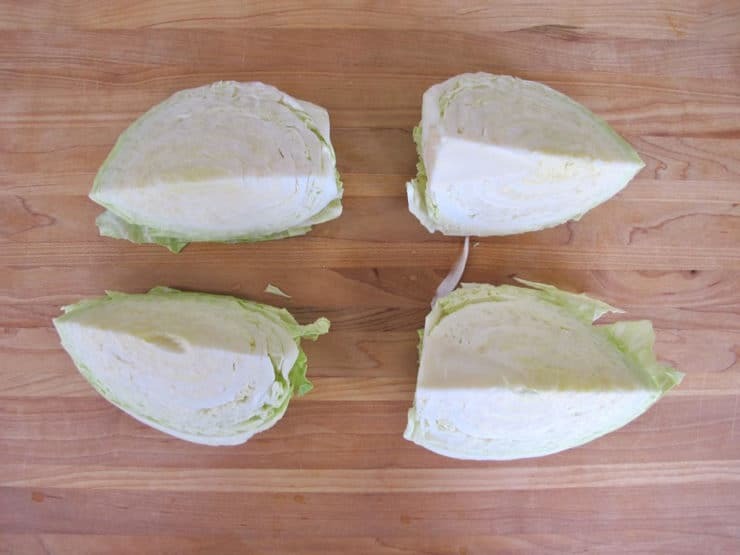 was in a pinch for time and I really didn’t want to get out all the machinery … so I did a search on shredding cabbage and there you were … and I will add your instructions were spot on and so worked for me… this was super easy and quick!!! Thank You!!! That is a good way to shred cabbage. My parents had a two bladed thing to shred it, but I can’t find it anywhere. I am also having trouble finding a good knife that stays sharp for a while.have any names of reliable good knifes. A’m al tost on tjie one. I couldn’t find my Dad’s Slaw recipe so I decided to look around and found this, It’s the same way he used to shred slaw with his big ol’ Bolo Knife. He made quick work out of shredding with that blade. Off to the kitchen! Lot’s of Slaw to make. I thought I was being silly by googling How to shred cabbage. Glad i came to your site. Perfect tutoriol. Once again i have proven i dont need a food processor, just a sharp knife. Thanks!! Best pictorial on the ‘net – thanks! I loved your tutorial on how to shred cabbage. 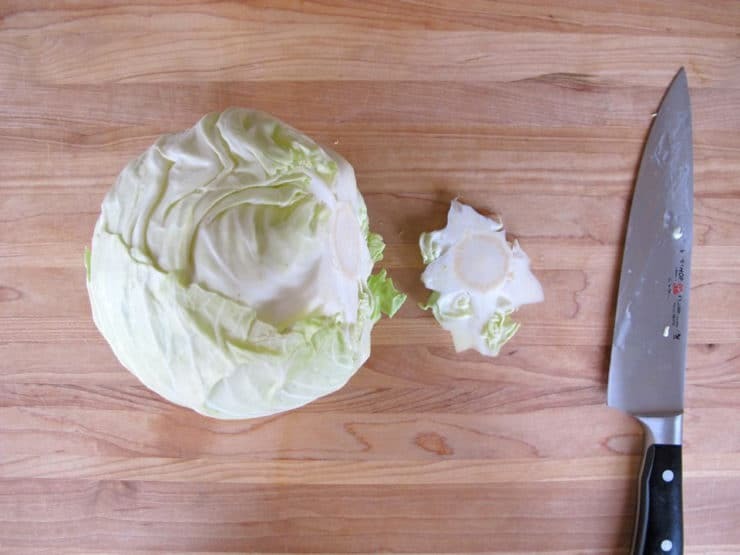 So simple, and all you need is a knife, cutting board and the cabbage, of course. Thanks so much, and please allow me to subscribe. I am making a coleslaw and was wondering, how much time beforehand can I shred my cabbage? Thank you! Hi Heather, shredded cabbage keeps quite well for at least 2 days ahead, sometimes longer. Just make sure the cabbage is completely dry before storing (no moisture from cleaning/rinsing) and store it in an airtight sealed bag. I am not sure I completely agree with Tori’s comment about drying the cabbage. Many vegetables benefit from a good water soak…peeled potatoes prior to making French fries, celery for extra crunchiness. I find shredded cabbage benefits from soaking in water in the fridge overnight, same as lettuce. Lettuce will keep for a couple weeks if kept in a wet Ziploc bag in the fridge. The need to soak is especially true if you buy the pre-cut coleslaw mix at your grocers. One package of coleslaw mix, one package of Marzetti’s or Marie’s coleslaw dressing and maybe a big spoon of hot horseradish and you’re all set. And there i thought i’d have to go buy some fancy kitchen appliance. Many thanks for the shredding tips. Thanks for the tip. Planning on making my own coleslaw this weekend. Every time I make cabbage soup or cole slaw, I refer to this tutorial. Thanks so much for teaching me! Yay Alice! So happy it helps! Thank you for showing this simple technique so clearly. Loved this tutorial. I have avoided shredded cabbage recipes because my shredding technique was never to my liking. This was great and so easy. Thanks. Great presentation. Just what I needed. I am trying to learn the basics of cooking at 69. It looks so easy when my wife does it but not when I do it. But I am getting better. Thanks to your great site. Chao. Hi Nancy, you are showing up as a confirmed newsletter subscriber, so you’re all set. You’ll receive the emails starting next Sunday. Thanks for subscribing! Luv,luv luv KFC cole slaw. But at $4 for a small container, I decided to make my own like Mom used to make. Put cabbage and 2 carrots into food processor, bad move! Way too fine and became mushy. Not successful. Therefore, your video on slicing is perfect. Will try again and just know it will be the right consistency. Thanks! I’m a die hard upper east side cook and I couldn’t imagine what I didn’t know! I love this site and So many great tips and recipes! So happy to have stumbled onto your pictorial essay. I was wondering about what kind of a kitchen gadget is a shiksa. I’m having a good laugh at myself about this. My Toronto high school pals would have called me a schmuck. I was on the verge of buying a food processor to get cabbage properly shredded for coleslaw. I miss KFC coleslaw, but not the calories, a lot. You have saved us a lot of unnecessary local bucks misspent, and appliance space in our tiny Korean kitchenette. Thank you, Tori. We are semi-retired Canadian profs living and teaching/tutoring in Busan, South Korea. We miss a lot of North American culture and familiar food, of course. Gotta run down to the nearby farmer’s market and load up on healthy purple cabbage, and the Chinese cabbage leaves so plentiful and cheap over here. Thanks again for the inspirational, synchronic tutorial. Have a fantastic day, Tori !! !